I close my eyes behind my sunglasses and hear their voices drifting across the years. Luke calling down to me, ‘Come and look at this, Dad.’ Mary perched on a rock, framed by the tilting sea, singing a made-up song. Summer-blonde, minds free as the breeze. This afternoon, there’s only the sound of sheep bells higher up the mountain, the whistle of the wind beginning to rise. It must have been forty years since I first found this hollow in the rock to sit in, the smooth patch to lean back on. The air is so fresh breathing is deliciously painful, but the winter sun is hot on my face. I open my eyes and stare at the rock opposite me again. I can’t remember when I first realised the marks in the rock were some kind of writing, a message for me. If I could only read it. I know that sounds crazy but I’ve always been pretty much in my right mind. And I wasn’t high. Even now, all these years later, I make walking up here one of the first things I do when I arrive in Deià. Before they discovered girls, boys and whatever else they got into back in their wildest teenage summers, Luke and Mary would climb up here with me. When we were no longer a family, I would come alone, leaving the latest girlfriend working on her tan by my pool, a suntan lotion and orange juice stained paperback over her face. I would come alone, climb the ancient path to sit where I am now and try to decipher the writing in the rocks. I give myself five minutes more of staring at my rock. A cloud rolls over the sun and the rock falls into shadow before the cloud drifts away. I shiver and zip my jacket up to my chin. Then the rock is plunged into even deeper gloom. I look up. The cloud that now blocks out the sun is thick, black and pregnant with rain. It’s as if someone spilled ink on the sky. But the sun breaks through the cloud. A shaft of pure golden sunlight strikes the rock. And for the first time in my life, everything makes complete sense. The feeling of joy soaring through every cell in my body stays with me as I come down the mountain, so intense it’s almost frightening. I am filled with light. Illuminated. Now the air is alive with far more than just the smell of wood smoke, the damp of the rocks, the musk of animals, the tang of wild herbs. The air glitters with meaning and I understand everything. I dance down the mountain. Darkness starts to fall but I’m not afraid. I am one with the rocks, the sky, the shifting sea, the surging torrent. I am a wise man. I know what I have to do next. By the time I reach the village it’s almost dark. Christmas lights twinkle above the main street. High on its mount, its Puig, the church tower is illuminated. Sweet light spills out of windows. Even the darkness sparkles. Joy is still fizzing up from deep inside me. I can’t stop singing ‘I saw the sign, I opened up my eyes and saw the sign’. I could turn cartwheels. The man lets out a squeal. When he turns around, I see it’s my neighbour Miles. My house is at the top of the Puig. Miles’s is the next one down. For a split second, I wonder why he’s not pleased to see me. Then I remember that we haven’t spoken for a good ten years. After he tried to get me involved in one business deal too many I blanked him until he got the message. He’s something or other in the music industry, like me. We’re about the same age but he wears a young man’s trousers and haircut. ‘Hi Miles,’ I say. My voice sounds strange in my ears and I realise I haven’t spoken to anyone today. Miles take a deep breath, closes his eyes then opens them slowly. His nose is red. ‘Andrew,’ he says finally. I hold out my hand for his cesta. He looks at me, takes the basket off his shoulder and hands it over. I hang it over mine. It’s heavy. ‘Having a party?’ I say. ‘Just a few people. Little soiree. Christmas Eve and all that.’ We walk in silence for a while, up past the Stations of the Cross, and I hear how heavily he’s breathing. ‘On your own?’ Miles says eventually. ‘Oh. Sorry.’ And, surprisingly to me, I really am. I could cry for Miles. Now we’re at Miles’s house. I hand over the cesta. ‘Call in for a drink any time,’ I say. By the way he peers at me in the darkness, I know he’s wondering whether I’m angling for an invitation to his soiree. He has no intention of inviting me. I don’t blame him. ‘Merry Christmas, Miles,’ I say. ‘Ho ho ho,’ he says, deadpan. I can’t get through to either Mary or Luke. I leave messages on both their phones. It’s been too long, I say. It has, and I’ve no-one to blame but myself. For a moment, I think about calling their mother but I know she’d put the phone down on me. I light a fire, pour myself a brandy and settle back into my favourite creaking old chair, its leather cracked and worn. My face is so hot it pulses. I resolve to put up Christmas decorations tomorrow, even if there’s only me to see them. Gazing into the fire, I remember how Mary would tell stories inspired by what she saw in the flames, stories of castles, faeries, brave knights and the dragons they slew. Over and over, I play A Fairytale of New York, that glorious, lurching, heartbreaking hymn to hope. Rivers of tears run down my cheeks. All the tears of all the years I never cried. Oh, but it’s a pleasure to weep now. It’s only when I hear the doorbell ring that I realise I must have fallen asleep. The fire is burned down to ashes, the castles are now caves. It’s almost midnight. Almost Christmas Day. The doorbell rings again and I shuffle over to the door. I wonder if it’s Miles, changed his mind about inviting me to his soiree. I open the door. Nada. Must have been someone who got the wrong house. The only sound is music from Miles’s. I look up at the church. It will soon be time for Midnight Mass. Behind the shining tower, a crescent moon and a single star. I look up at the sky. Everything around me is breathing. I feel joy rise again. I hear the tinkling laughter of children hidden in the darkness. I know now. 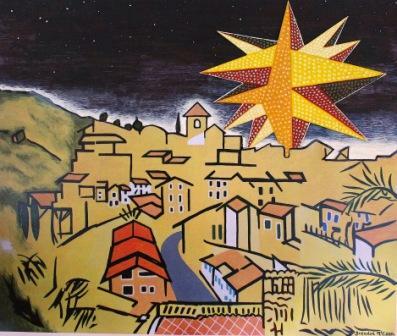 Star of Deià painting by Brendan McCann. Thanks as ever, Bren.